Chris Harden is a Thelemite who associates with Crux Ansata Oasis, in the Valley of Denver, Colorado. As a teenager I became involved with the Hare Krsna movement. I began having spiritual experiences and became fascinated with religions. I was desperate to find how those experiences could be seen through the lens of western religion. This quest eventually brought me to Kabbalah. I began pursuing correspondence courses through the Rosicrucian Fellowship. I also began working through Donald Michael Kraig’s Modern Magick around this time. My family had been involved in Freemasonry and I was curious about that. In 1995 I became the first white person to be initiated into the oldest Prince Hall lodge in Jacksonville Florida. I was hooked on the esoteric aspects of religion but most of my Masonic Brethren were Christian and seemed to have little interest in the esoteric teachings. Around this time I read about the group Ordo Templi Orientis. It seemed I had discovered a group that was Masonic in its structure and foundation but had incorporated magick, yoga, and tantric elements into their system, I thought to myself, “sign me up twice”. It turned out there was an OTO lodge in my town of Jacksonville Florida. What I found was one of the most active and scholarly group of magicians I have ever known and they would change my life forever. On September 7th 1996 I was initiated into the Minerval degree by John Plymale, Frater Brihisphati, for Ra-Harakhte Lodge in the valley of Jacksonville, Florida. John did my first degree on Febuary 1st 1997. John Plymale was a professor at the community college I attended and we spent a lot of time together. Him and Bob Pendell, together, would take me under their wing and provide excellent instruction for years to come. This is where I received instructions on the basic ins and outs of Thelema. Thelema resonated with me instantly and I knew this would be my path for the rest of my life. What drew me to Thelema was meeting a group of Thelemic exemplars who lived their lives according to their word and their will. I think Thelema offers a very unique perspective on Magick. Unlike other groups Thelemites understand that Magick is not something we do just on the weekends with friends. Magick for us is a conscious awareness of the subtleties that influence our process of decision making from the most mundane to the most sublime of activities. We are constantly striving for the purest expression of our true will, to make each act intentional. Crowley has provided us with a definition, a postulate, and a host of theorems which provide the most complete and comprehensive theory of Magick the world has ever known. Magick is an act of will and none can help but express their will in whatever capacity they are capable. To this end we employ the use of ceremony and ritual in our practices. The goal is similar to the way one learns to play their instrument, or Kung Fu, or even dancing. In each case we practice a routine so that we may train our bodies to react appropriately without the hindrance of thought. In Magick the goal is the same. Through the daily practice of ritual we sharpen our will so that it may better pierce the veil of mind and matter. Through Magick Thelemites seek the most honest and true expression of themselves. Thelema represents the pinnacle of human evolution so far. It challenges us on every possible front. It is true that I can find traces of anarchism, existentialism, Kant, Gnosticism, and so on in Thelema. What I think makes Thelema unique is that at once it is a political movement, a religious movement, a philosophical movement, an ethical movement, an artistic movement, and a scientific movement that challenges us to unite all of the banners in our life under the universal maxim of, Do what thou wilt shall be the whole of the Law. To those who may fear the radical nature of our law I would labor to remind them that fear is failure and courage is the beginning of virtue. The most courageous thing one can do is to seek a full and honest expression of themselves and to give others the space to do the same. In the age of the child the only way to save the world is to save oneself. OTO is the great Thelemic social experiment of our day. I think Wasserman’s description of OTO as Karma Yoga is extremely apropos. There are many valuable lessons to be learned from coming together as a group and achieving goals as well as what we learn from the bonds of fraternity. Lets face it, many of us attracted to this path are weird and eccentric. We are quirky and sometimes idiosyncratic. In OTO we learn how to effectively communicate and work with one another despite any of our differences. We learn how to step up to the challenge of service to the goals of our greater Thelemic community. I think that OTO also embodies concepts of Bhakti Yoga, of devotional service. Here we have the opportunity to serve our Brothers and Sisters in a way I don’t think would be possible otherwise. Here we see that sometimes magick works more like work than like magic. OTO provides a testing ground for our Thelemic principles in practice within a social context. What drew me to the OTO was its unique history and perspective on the path of initiation. I loved the system and the way it was designed. The tantric influence such as can be seen in the way the chakra system aligns with the man of earth degrees was something I found very attractive. When I finally made contact what I found was a very active group of sincere and hard working magicians. They had a busy schedule of monthly classes, activities, and social affairs. For me it was like finding a school for the occult. I was only 19 years old and I was ready to learn. The level of instruction I gained from this group changed me forever and I will be forever grateful. As I worked the system and what was offered by our group I began to experience a level of friendship deepened by the bonds of fraternity. I love the experience of meeting other Brethren in OTO and instantly knowing that we will be friends for life. As it turns out I came for the Secrets but I stayed for the Love. I think that the most important practice is a regular practice. Students should be careful to only take on what they can manage on a daily basis. It is less important that they are doing something complicated or long than that they are doing it regularly. If you want to learn to play guitar then one needs to be prepared to play guitar for an hour a day every day. Once the student learns to manage their practice time we can begin a meaningful discussion about adding substance to their routine. If one wants to learn bluegrass then I would prescribe sets of fiddle tunes to their routine. If the student wants to play jazz I would start them on a regimen of modal exercises. When it comes to meditation I prefer the more active aspects, the ones which allow an easy focal point for concentration. In pranayama I have my lungs and my breath counts to focus upon. Using a mantra gives me the vibration to center in on. I find various kinds of yantras useful in this as well. Pranayama has likely taken me the farthest. I have had great success with the breathing exercise given to us from Crowley in Eight Lectures on Yoga. Here he prescribes taking a count, breathing in for that count, holding for the count, then breathing out but doubling the count, then holding again for the count. To start I recommend trying a count of four. If one does this daily they can increase the count to twelve or fifteen in just a few weeks. The kriyas can be intense but if you can manage to sit still you will be shooting out of your body in no time. The most active form of meditation I know is ceremonial magick. Here there are many curriculums such as from The Golden Dawn, A∴A∴, or even OTO itself. If one is working in a group with a curriculum then it is important for them to follow their curriculum to reap the most benefit from that system. That said I think a good example of a fundamental component to many curriculums would be the daily performance of the pentagram ritual. It has been said that if one is not in a group but seeks to be then start performing the LBRP and you will find a group to work with shortly thereafter. The LBRP and its variants are often presented as microcosmic or elemental banishings. After years of daily performance I have come to see it as much more than that. In short, the LBRP is a daily attunement or alignment to the Great Work. It is a daily orientation of self to will. I highly recommend a daily practice that is centered around this. Definitely people misunderstand Crowley and in particular I think people get confused about some of the Satanic imagery that Crowley associated with. Early on Crowley was a challenge for me. I didn’t appreciate his style of writing and found it difficult and in some cases boring. The concepts and practices of Thelema resonated with me instantly and thoroughly but the Prophet took some time for me. I noticed that as I learned more in school Crowley became more accessible to me. I can honestly say that after fourteen years of college studying philosophy and mathematics I now find Crowley very accessible. Also, as one progresses through the system they are open to having experiences that will make some of the Liber’s more relevant and often times the meaning will change entirely for you. Crowley, for me was a labor of love and now I can honestly say I love Crowley. Some of the first books that really helped me were, Eight Lectures on Yoga and Magick Without Tears, and I highly recommend these for a nice start. If one is interested in the practice of Magick I highly recommend DuQuette’s The Magick of Thelema. Also, I found Brother Richard Kaczynski’s book, Perdurabo to be extremely helpful in putting the life of Crowley into perspective which has garnered a great admiration of Crowley the man within me. I think Perdurabo should be required reading within any Thelemic circle. I think second to Crowley for being misunderstood would be our maxim of the Law. Do what thou wilt shall be the whole of the Law has been poorly interpreted and largely misunderstood. Beginners and critics alike are apt to interpret this to mean do whatever you want. Crowley warns us in Liber II of this very distinction, “From these considerations it should be clear that “Do what thou wilt” does not mean “Do what you like.”” For the sake of promulgation I am constantly searching for new ways to express our universal maxim so that its truth may reach as many ears as possible. To date OTO is the largest public face of Thelema. It is the largest group offering events that people can attend and is often the very first interaction people have with Thelema. I think this allows OTO to have a special advantage in the promulgation of our Law. Also, under the auspices of the EGC people are offered a powerful and unique Thelemic religious experience. For me, EGC is my primary religious expression. As clergy and aspiring clergy we are given an opportunity to celebrate mass as officers. We are given the opportunity to serve a congregation of Thelemites. The religious expression of Thelema has become more and more prominent as I consider the very meaning of Thelemic Priesthood in my life and the life of my congregation. 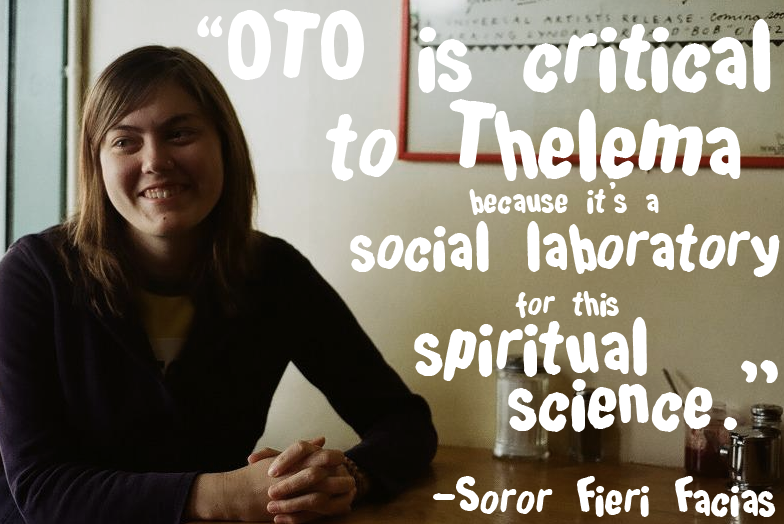 OTO offers a host of ways in which someone can express their ideas about Thelema. There is the path of initiation, the bonds of fraternity, religious expression through EGC, political expressions are made in the many levels of government of our bodies, social expressions, artistic expressions, philosophical expressions through our many classes and discussion groups, and the list goes on and on. To put it simply, OTO is the great Thelemic social experiment. Thelema is a radical and universal orientation of the individual towards the self. It is a challenge to our political, philosophical, and spiritual understanding. We have but one simple and universal maxim, Do what thou wilt shall be the whole of the Law, the application of which is individual but the applicability itself is universal. We thus avoid the pitfalls of relativism while also escaping a meaningless chasm of abstraction. The challenge of Thelema is to realize the unlimited nature of true human sovereignty and freedom and to see the core truth of ourselves as it is. I think the OTO will grow and I would certainly like to see it grow continually with respect to an exponential pattern. The thing I struggle with is this. The Law is for All; however, the path of initiation, the study of ceremonial magick, and so forth may not be for All. In fact, I suspect that the percentage of the All that is for the path of initiation will likely always be fairly small. Therefore I see that if OTO were to grow exponentially that there would come a point where the growth would level off as it reaches the percentage of the All that is for initiation, for example. The question becomes how we are to reach the rest of the All if they are not attracted to OTO as a system to work. I think this is where the function of the EGC becomes crucial. I think the expansion of the EGC and its functions could play a critical role in bringing Thelema to a wider audience. I think we should have trained Clergy participating in religious, political, and philosophical debates at universities. We should have regular services to our Brethren behind bars. We should brainstorm on ways of serving our local communities in a way that has reach and impact. In this way the EGC may become recognized as a helpful force within our local communities pressing more folks to inquire into Thelema. What we all really need is to figure out the financing of our movement. I believe if we could find ways of generating greater revenue it would make our goals achievable. We should invest in a training program that can show our local body leaders successful ways to run a “profitable” non-profit. These are a few things I would really like to see developed in the future. Thelemites fortify themselves with training to be able to experience both the darkness and the light, so that we may make use of both the ups and the downs. We understand that there is joy in the going. We seek our truest expression of self and see the hidden potential within every situation. We accept the challenge of freedom and give others the space to do the same. We are the ones who dare to see beyond the tips of our noses. We will our actions mindfully as we explore. We use our capacity to know so that we may discern between what is useful and not. We keep silent for we understand that the truth of our secrets cannot be communicated by word. For we are the Upsidedownians and we walk upon our hands. The Mass tells us a story of The Great Work completed. It provides a formula for the realization of god as man. It provides communicants with a means of amplifying their will through a direct interaction with the 93 current. The Mass fuels an astral space that can then be used by the Order. It provides clergy and aspiring clergy with a means to interact with the thaumaturgy of our ninth degree and thus a path of adepthood. Overall I think the Mass provides a Thelemic religious experience to its congregation. This is the central rite of our Order. I love every aspect of our Mass. Personally I enjoy serving as Priest the most. It just feels like something I have always done and has become a great focal point in my life. Thelema may be the first time since the aeon of Isis that the religious perspective has completely caught up with the scientific perspective. The two positions no longer have to stand in opposition to one another. I think we owe it to future Thelemites to constantly test our understanding of Thelema against modern theories of science, philosophy, and emerging political climates. We are further away from the old aeon than Crowley was and perhaps we are in a better position to judge the implications of Thelema for ourselves against the backdrop of our positions within modern society. We must carry the tradition, the method of science, the aim of religion.